N150 (150 gals / 660 l) Full Kit. For use with both Marine and Freshwater Aquariums. For 0 - 50ppm nitrate systems. Combined together, the Nitrate and ph booster is a perfect combination keeping the biological and chemical levels in balance. With the slow feed going through Nitrate (central sulphur chamber), the the ph booster (calcium) chamber. 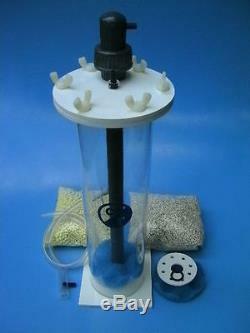 This kit improves water quality.. Reduces nitrates (if not completely) and stable Alkalinity within your aquarium. These reactors can be situated in a cabinet without a sump..
And are safe for both Marine and Freshwater aquariums. Use with a dosing pump, or a T Piece (Provided) and valve for use with existing pump lines. Also due to its pressurised design allows you to sit the reactor below the water level... Allowing the nitrate reactor to sit in the cabinet while pushing the effluent back to the raised aquarium above. N150 Reactor, Nitrate Media, Calcium Media, Tee piece, 2 metres of Piping and Control Valve. Please state size of Tee piece required ie 10mm, 13mm, 16mm, 20mm, 25mm or 40mm when ordering the N150. With these reactors they come with a kit allowing you to use any existing pump supply... This is done by the use of a Tee Piece (supplied).. This allows you to'cut' into the out going pipe of the pump... And as these reactors are drip fed, there will be no or little interference with the running of the existing pump... So you can use your external, return or a power head to run. The Kit contains everything for need to get going. All l would need from you is the diameter of the out going hose of the pump and l ll send a Tee Piece to fit. The Nitrate (yellow) media will last from 2-4 yrs... And the calcium media will last around 12mths before requiring topping up. Height: 400mm Base footprint: 130 x 130 mm Column Dia: 90mm. The item "N150 Nitrate Reactor (660 ltres) Full Kit" is in sale since Monday, October 27, 2008. This item is in the category "Pet Supplies\Fish & Aquarium\Filters".